This would be a lovely cake to serve at any holiday gathering, especially around the holiday season. 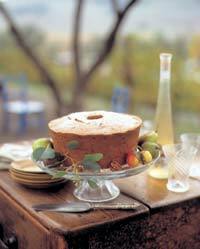 Serve this delcicious and rich cake with a nice "fruity" white wine. Butter and lightly flour a 10-inch (25 cm) tube pan. In a medium bowl mix the sugars together and set aside. In a very large mixing bowl beat butter with an electric mixer until soft and fluffy. Add half of the sugar mixture to the creamed butter. Increase the mixer speed and beat until smooth. Set aside. In a large bowl, beat eggs with a whisk until light and fluffy (about 5 minutes). Gradually whisk the remaining sugar mixture into the eggs. Continue whisking until you have a smooth, creamy consistency. Add this mixture to the butter mixture; whisk until smooth. In another large bowl mix flour, mace, and salt together. Alternately add the flour mixture and the white wine to the butter-and-egg mixture, mixing well with a wooden spoon after each addition. Stir pecans into batter. Pour batter into prepared pan; place on a baking sheet. Bake in a 300° F (150°C) oven about 2 to 2¼ hours, until cake is golden brown and a knife comes out clean when inserted. Cool 30 minutes, then turn out onto a wire rack to cool. Cool cake completely, and dust top with confectioners' sugar if desired. When ready to serve, cut cake into thin wedges as it is quite rich. For best flavor, age cake by wrapping in foil or plastic wrap and refrigerating for 1 day. Cake can be refrigerated up to 10 days. Do not freeze. Great cake for those who like their sweets not too sweet. Also great for large dinner parties or buffets as cake serves many and is great made in advance. This cake is fabulous! I've made it many times, and I get people asking me all the time when I'm going to make it again! I like to use walnuts instead of pecans, but that's just my preference. An excellent cake, and gorgeous! I hate recipes requiring ingredients which are unattainable. In this case neither wine can be had on line.